Rand Paul’s wig is having a bad hair day, and so is Rand Paul. US Senator Rand Paul (R-KY) is the 50 year old ophthalmologist and wannabe president from Kentucky, whose primary claim to fame prior to his election to the Senate, was that he’s the son of perennial presidential candidate, former Rep. Ron Paul (R-TX). On NBC’s Meet The Press last Sunday, substitute host Savannah Guthrie challenged the Senator to explain why he was a proponent of the government shutdown. The president shut down the government? WTF??? President Obama DIDN’T shut down the federal government, Congressional Republicans DID shut down the government. The GOP has completely abrogated their responsibility as elected representatives, and only the dimmest bulb among us would characterize the shut down as a problem created by President Obama. 1. To Wig Or Not To Wig – That Is The Question! Kentucky Senator Rand Paul believes that persistent anti-gay discrimination should be protected. 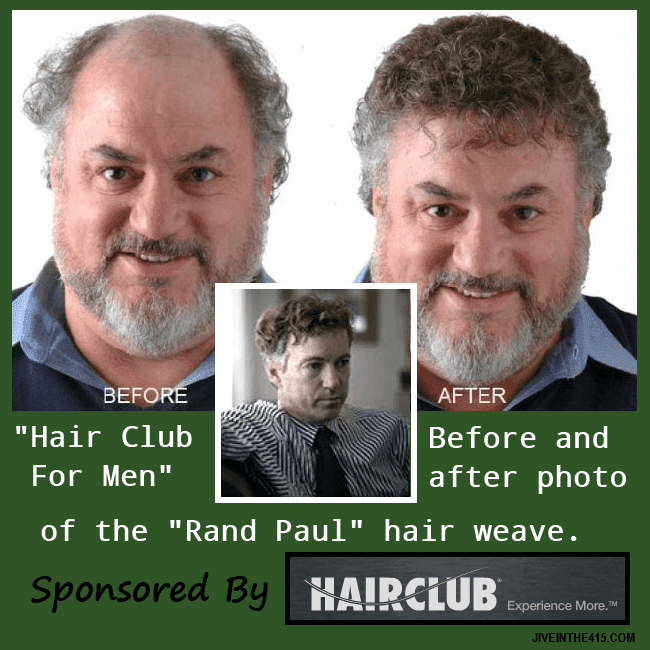 Whenever I see Rand Paul on television, I find myself fascinated with his fancy permed hair-do and his seemingly bald head. He always looks like he had a bad day at the beauty parlor, and on Meet The Press, it looked like his wiglet was slightly askew. I know that going bald can be a traumatic event in the life of an adult, whether male or female. I can appreciate that a public figure craving attention, with presidential ambitions, wants to be telegenic with a full head of hair, whenever they campaign or appear on TV. Wearing a toupée or a wig or hair weave is not criminal, and I have some friends who are clients of “hairclub for men,” and you’d never know that they’re as bald as a cucumber. I applaud and support their skill and herculean effort to hide their male patterned baldness, and if I was confronted with being bald myself, I might opt for a toupée too. The difference between my friends and Rand Paul is that my pals don’t want to be President of the United States. We’ve had many bald headed presidents in the past, including Dwight David Eisenhower and Lyndon Baines Johnson, so I wonder why the Senator doesn’t ditch the wig. 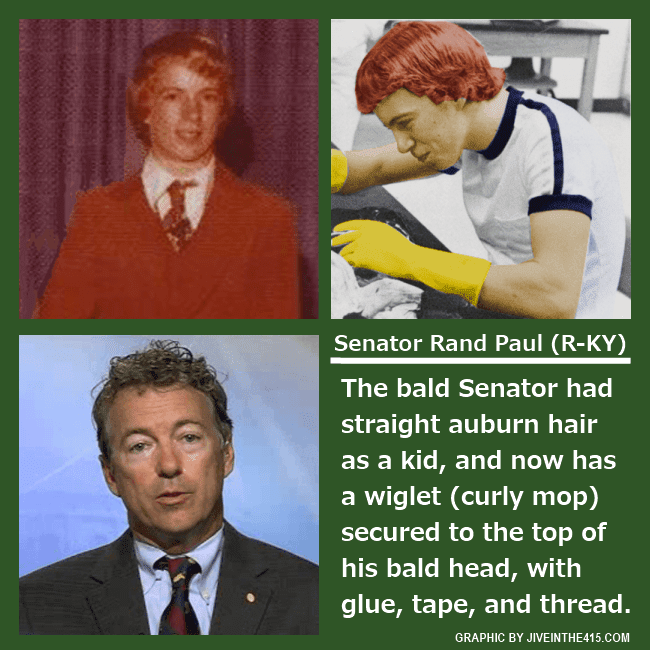 Rand Paul has continually denied that he wears a rug or wig or toupée, even though there’s ample evidence to the contrary. Just have a gander yourself and look at the photos. He was a ginger haired kid with straight hair, and now as an adult, he has a wild perm. Where’d that come from? Senator Paul lied about the government shutdown on Sunday’s Meet The Press, and he’ll keep up the lies about having a “bad hair day” and his ill-fitting wig. He’ll say that it’s President Obama and the Democratic party’s fault for his “bad hair day,” because the Senate barbershop is closed due to the government shutdown. A very bad hair day indeed.